Ultrasonic transducer elements sealed in a liquid-tight housing are an option to transducer elements permanently bonded to the side or bottom of a cleaning tank. The major benefits of immersible ultrasonic transducers are that they are easy to service and can be added to existing equipment, often without extensive tank modifications. All of Blackstone-NEY Ultrasonics unique technology is offered in the immersible transducer format. This includes standard individual frequencies from 25 kHz to 270 kHz as well as multiple frequencies in a single or multiple units. Patented dualSWEEP® and upSWEEP® functions are included. Blackstone-NEY Ultrasonics immersible tranducers are intended to withstand the abuse unavoidable in a heavy industrial environment. Standard units are constructed of heavy gauge 316L stainless steel with other materials available for use in challenging process applications. Units are pre-tested prior to sealing to assure that all transducer elements are performing exactly to specification. Once sealed by full penetration welding, the finished units are function tested in liquid for a minimum of 24 hours prior to shipping. Blackstone-NEY immersible ultrasonic transducers are powered by Blackstone-NEY proprietary ultrasonic generators. In installations of large numbers of transducers, Blackstone-NEY Ultrasonics generators can each provide up to 2,000 watts of ultrasonic power each reducing the number of generators required by as much as half. Multiple generators can be integrated in a common electrical enclosure. Cooling and environmental protection can be included if required. Immersible ultrasonic transducers do not require attachment to the tank (other than to hold them in position) to function efficiently. As a result, transducers can be moved from tank to tank and positioned as required for special applications when needed. Various mounting options are shown below. 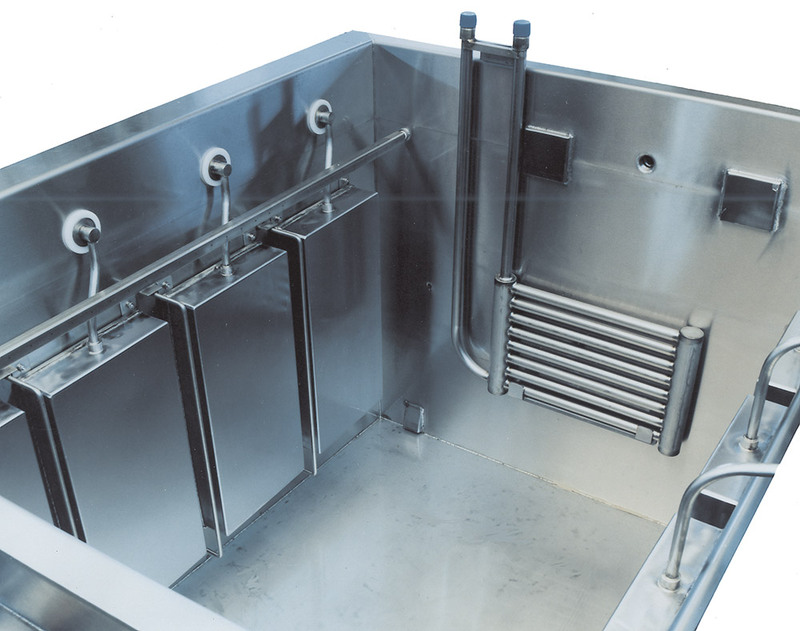 In addition, Blackstone~NEY Ultrasonics experienced engineering team is available to design a custom immersible ultrasonic transducer installation for any cleaning or process application.